The team has been busier than a pack of Brownies in a bag of catnip! Thereâ€™s plenty coming up this year, so letâ€™s get right to it, shall we?! First, on Tuesday, May 2nd we are launching the first of our Level 100 Co-opetition Challenges in the Proving Grounds! What the heck is â€œco-opetitionâ€? Wellâ€¦Cooperative Competition, of course! In teams, you can compete side-by-side with other groups â€“ and even sabotage their progress â€“ as you mow through baddies so you can win! Why win? For new loot and bragging rights! We will start with one Co-opetition Challenge and switch it out with a new match type or layout periodically. Woot! But what if you arenâ€™t level 100?! Weâ€™ve got your back! If your EverQuest II account was created before today (April 20, 2017), you will be able to claim one free Level 100 Boost Bauble for one character. The Boost Bauble offer will begin on Tuesday, May 2 around noon PDT and end on Monday, May 15 at 11:59PM PDT. The Boost Bauble will get a single character to level 100 (if it is below that level) and grant you a set of gear that will allow you to jump right into the Co-opetition Challenge and compete. The Boost also makes characters heroic enough for Kunark Ascending expansion content! If you have a new account created today or later, you can claim a Boost Bauble if you buy an active membership during the date and time ranges noted above. If you want to check out the action, we will be livestreaming the morning it goes live! Come watch as developers show off their first foray in the Proving Grounds as they try to win against a team of players. Details of the livestream are below and we hope you can join us! At the same time, you can bid a warm welcome to a new feature: Familiars! Norrathians will begin to form lifelong bonds with mysterious, menagerie creatures. These creatures grant their owners benefits and bonuses that will take your hero to new heights! 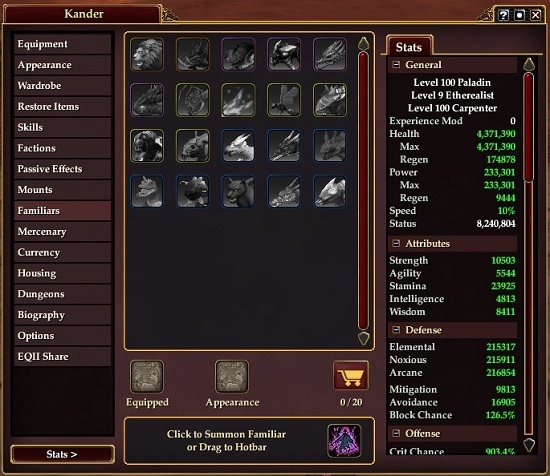 (Some Familiars will give players stats that allow them to go beyond stat caps!) Familiars will drop in the Proving Grounds as well as Kunark Ascending missions and public quests! Not only all that, but we are preparing to release another Time-Locked Expansion Progression Server called â€œFallen Gateâ€ this summer. This particular server is unique in a few ways. I call it the â€œHeritage Hoarderâ€ server. Why? Every Heritage quest you complete will enable all the characters on your account to claim new Heritage rewards! Expansions on Fallen Gate are set to unlock every twelve weeks. The dates will be on a schedule we will make available. For more details on all this news and more on Fallen Gate, please read Kanderâ€™s Candor post here. Also, in case there was any doubt, I wanted to share that we have been working on this yearâ€™s expansion for quite a while now. Look for more on that coming later in the year. As we head into the summer, we wanted to renew our commitment to chatting with players. I invited Lauren McLemore, our producer, to tell you more about our in-game chat plans and more! Iâ€™m very happy to announce that Windstalker, Kander, and I, along with some other team members, will be hosting Ask Me Anythingâ€™s on live servers later this month! We want to get in the game and hear from you. To that end, each server will have its own timeslot so everyone will have the chance to come and chat with us. These AMAâ€™s will be spread out over April 26th, 27th, and 28th and each is planned to last an hour. Weâ€™ll do our best to answers as many of your questions as we can! You can find the detailed schedule of the AMAâ€™s near the bottom of Kanderâ€™s Candor. This will be my very first AMA and I canâ€™t wait for the chance to talk with all of you. Be sure to get all of your questions ready! Iâ€™m really excited for everything upcoming and hope you all are too! Come test your mettle in the Proving Grounds. This May weâ€™ll be releasing two new cooperative competition zones that allow groups of up to six to compete against each other in timed races to see who can complete the zonesâ€™ challenges first. The fastest times for each round, currently set for seven days, are recorded on a leader board for everyone to ohh and ahh at (and try to beat) until the round ends. The fastest group in each round could possibly win an extra set of rewards, and the acclaim of all their peers. Rewards can be claimed from the victory merchant located in the Proving Grounds lobby. You can bet there will be some Best in Slot items available here to earn for everyone who wants to participate. Proving Grounds utilize the battleground server technology to allow all players within a region to compete with or against each other. The first of these will be available starting on May 2 with GU103: The Menagerie. Weâ€™re going to be unlocking a new TLE server this year, Fallen Gate. This server will differ from Stormhold, as there wonâ€™t be voting and expansion content will open automatically every 12 weeks. There will be an exact schedule for this and you will know exactly what day each expansion will go live. As we get closer to release we will have more information, but we wanted to talk a bit about Heritage Quests on this server. As a benefit for those who play on the new server, so finishing Heritage Quests on Fallen Gate will unlock some cool rewards for your characters on the regular servers. In addition, there are lots of new achievements, titles, and rewards to be earned here for those who are interested. Anyone who has completed their epic 2.0s will have access to this quest and event, which will show them how the story for this expansion wraps itself up (and possibly even some clues as to where we are going). Oh, and everyone who completes the epilogue quest, gets this little gem. Speaking of Heritage Quests, weâ€™ve added a new one in the upcoming game update. This quest series has a Heroic portion that grants a new Heritage item, and an Epic portion that will upgrade the item players received. Summer Ethereals are coming. Without giving too much away, there will be a new Best in Slot cloak that will be able to be earned, and there should be some cool new mechanics involved in getting this awesome item. An orange adornment slot will be ready for some very powerful effects will also be available during this event. Experts in the mysterious menagerie have discovered a subspecies of creatures that have been found to increase the masterâ€™s ability to channel greater power. System-wise that means these creatures will primarily focus on over-cap stats, such as Fervor, Crit Bonus, etc. They can be collected and added to a sticker book in your character pane that will display the first 20 familiars. Familiars are not a controllable pet, and may be hidden if the owner wishes to do so. You may only summon one familiar at a time, but you may use any familiar you own as an appearance familiar. Familiars will be found from many sources within Norrath. Two points on the passive deity abilities (Divine Potency, Divine Crit Bonus, and Divine Stamina). 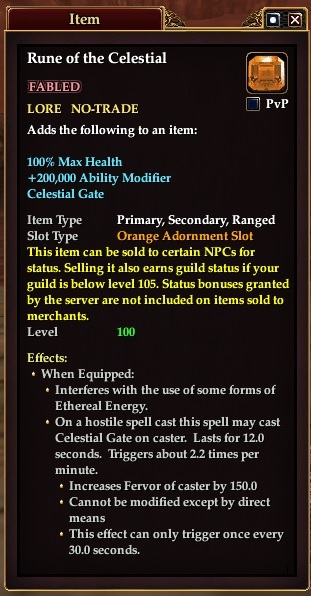 First, while the passive deity abilities have been very successful in giving players something that their experience can always be used on, the gap in power for those that have been investing in the abilities is growing beyond what we wanted to see. Weâ€™ll be updating Divine Potency and Divine Crit bonus to have a diminishing returns curve in the next few weeks. This will go simultaneously with a reduction in mitigation on many Kunark Ascending heroic and raid encounters, so the overall impact on actual damage dealt should be negligible for players with over 30 points in Divine Potency or Crit Bonus, and a net gain for players with less than 30 points in those abilities. Second, account wide passive deity abilities is still being worked on to be an upcoming feature, where your alts on live servers will benefit from the highest level of each of the passive deity abilities. We do not have an ETA locked down just yet, but it is pretty high on our priority list. In the upcoming expansion, weâ€™ll be doing a major revamp of class balance focusing on bringing each class back into line with their intended roles. Specific areas of focus will be tier 1 DPS classes that are not performing as well as desired, and more support buffs and debuffs for several healer classes and expanded support for enchanters and bards. To help any of our returning players jump right into Kunark Ascending we will be granting all accounts a claimable level 100 boost bauble, from May 2nd through May 15th. This bauble will set a character to level 100, and grant a crate of gear so they can jump right into the start of Kunark Ascending and the Proving Grounds. Once you have completed an Epic 2.0 quest on any character, you will now be able to purchase the Guise of Pursuit for your alternate characters on the same account. This bauble will raise all of the factions required for any of the Epic 2.0 quests to max level so that you may bypass any of the faction requirements on that character. If you did the work to get your new epic, here is a way to help along your alts. The Guise of Pursuit will be available on May 2nd, with GU103: The Menagerie. AMA on Live Servers April, 26th , 27th and 28th! Weâ€™re really looking forward to expansion 14 and we will release more info later this year. In the next expansion, we will be raising the level cap this year to level 110. We feel the destination finally warrants it! Expect to see lots of bonuses over the summer for preparing for the increase, including our Gear Up, Level Up promotions.